Hi All! St Patrick's Day is a great time to have fun with your kids. Mine are fascinated by the idea of little men running around creating mischief. 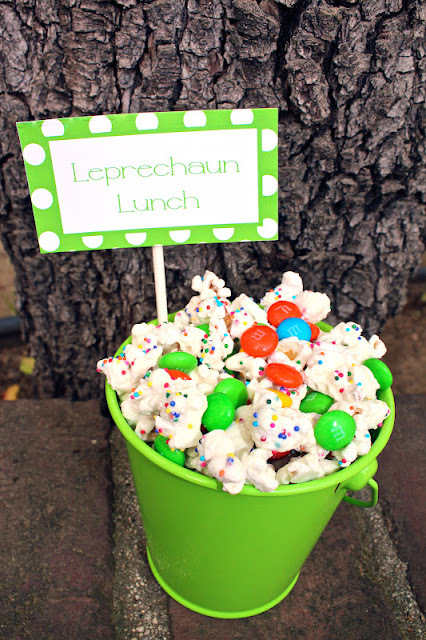 Maybe it's because they have a lot in common (just kidding) Leprechaun Lunch is the perfect snack to celebrate this holiday and I've been getting so many request for my tags that I thought I would do a repost. Direct access to the original tag is available here. I also designed a new tag for 2013 shown below available here. I was so excited to have my recipe for Leprechaun Lunch published in Yum Food and Fun Magazine- my first paid writing job:) You can find the original recipe here. Congrats Jenny! What a fun idea and can't wait to get a copy! Congrats! This looks so fun, thanks for sharing. I so love this recipe. I made a holiday version for Christmas and my youngest loved it. He asks me to make it for him all the time. Thank you for sharing. Congratulations!! Totally cute and perfect for the family!